New music from Scandinavia across styles, cultures and frontiers! Veterans of the international music festival circuits, this is HImmerland’s first visit to Whangateau Hall. 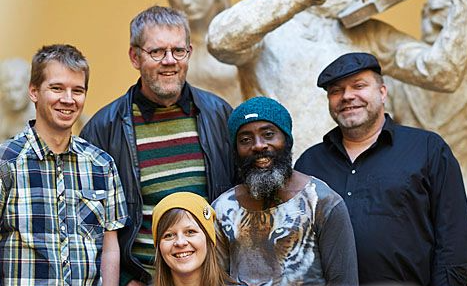 With members from Denmark, Ghana, Scotland and Sweden, is inspired by the exciting and very varied cultures of the five experienced musicians in the band – We fuse the different cultures and genres that are brought into the band, but always with respect form the origin of the traditions. During touring in they UK over the last years, they met Scottish fiddle player Mairi Campbell and happily invited her to come play and sing with the band. MAIRI CAMPBELL(Vocal, Viola) Mairi Campbell is a pioneering figure in Scottish music. Her musical interests are wide ranging, from playing Scottish dance music to pushing the boundaries of the traditional music scene with her soundings and improvisations. Mairi has won several awards for her musicianship including Instrumentalist of the Year and Scots Singer of The Year at the Scots Trad Music Awards. ESKIL ROMME (Soprano Saxophone) is from Funen, but has lived in Himmerlands in Northern Jutland, most of his life. During the 30 years Eskil has played, he has mixed traditional Danish music with jazz and otherrelated genres. On his many travels in Scandinavia and the UK, he has developed his very own “North Sea blend” of sounds and styles. In 2009 he released the album ” Himmerlandsmelodier”, which also was the beginning of the band Himmerland. Eskil is the artistic director of the small but well-reputed Halkær Festival, and he is known for its many international tours with bands like “Færd” and “Kryss”. JENS ULVSAND (bouzouki, vocals) From Sweden, has been an integral part of the Swedish folkmusic scene in the last 25 years. Beside his work as a touring musician, Jens is a highly respected teacher at the Music Academies in Malmø, Sweden and Odense, Denmark, and he has a long career as composer for Swedish theaters. Jens Ulvsand has years of experience on the Swedish folk music scene, and combines his work in Himmerland with Trio Mio, with membership of Swedish Avadå Band, and toured the world with Danish Færd, KRYSS and Jullie Hjetland & Jens Ulvsand duo. belongs to the new upcoming generation of very well skilled young musicians. He has played with a number of the new bands that shows where Danish Folkmusic goes these days .. bands as Mads Hansens Kapel and Tailcoat, and he’s an experienced player at Traditional Danish Dancing .Emil studies El bass at the Music Academy of Aarhus. AYI SOLOMON (percussion, vocals) is from Ghana but has lived in Copenhagen for more than 30 years. Solomon enjoys great respect wherever he has played the last several years, both in Denmark and internationally. He has released two albums in his own name, and he has performed and toured with a wide range of top professional bands and projects in genres like world music, rock, pop and jazz. Among the best known are “Pierre Dørge & The New Jungle Orchestra”,”Moussa Diallo Band” and “Palle Mikkelborg”. This entry was posted in Uncategorized on April 8, 2019 by Jenine Abarbanel.